There is nothing understated about Riyadh’s King Abdulaziz Conference Centre. It may be situated on a grim, dusty bypass and its name may conjure up an image of beige-painted auditoria littered with plastic coffee cups, but once you have passed through its bronze security gates nothing could be more different. Corridors with deep carpets, lit by enormous gold and glass chandeliers, lead into a succession of anterooms furnished in full Louis XIV repro. The brightness is overwhelming. There are no signs or arrows or other directions. So the visitor blinks, settles on a gilt-edged sofa and waits to be told where to go. On the other side of a door, through which liveried servants are scurrying, is lunch. But once the door opens, the interior is revealed to be not so much a dining room as a vista, an endless expanse, the far side of which is almost out of sight. This vista is starting to heave with people, mostly men, some in the swirling whites of Gulf dishdashas, some in a dozen styles of military uniform, some in the more colourful robes of Asian and African dignitaries and a few more in suits. To the visitor’s left hover Jared Kushner and Ivanka Trump: the First Millennials are as immaculately suited and coiffed as ever, but even they look overshadowed. Apart from anything else, they are about half the average age of everyone else. The circular table at the centre of this ballroom is filling up. The visitor ticks off the national leaders he recognises: Sisi of Egypt, Abdullah of Jordan, a bevy of North Africans. 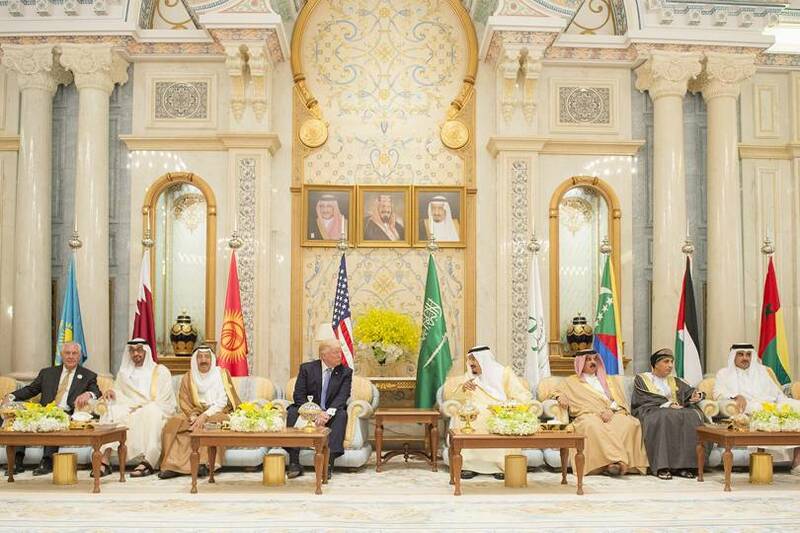 Saudi Arabia’s King Salman, Custodian Of The Two Holy Mosques, is there, of course, as host, but it is two other men we are here to see. In marches President Trump, in his peculiar mixture of shamble and strut, and takes his place as guest of honour next to the king. He looks around, takes it all in. He is at home with the style, but perhaps even he is impressed by the scale – that was certainly the intent. Then, behind him, we see first the beard and then the bulky form of the man who, we subsequently realise, this is all really about: the Kushners’ millennial counterpart, the man in whom Saudi Arabia’s millions of frustrated young men and women have placed their hopes, the 31-year-old crown Prince Mohammed bin Salman. This was 18 months ago, and the Riyadh Islamic Summit of May 2017 was, almost literally it seemed for a while, MBS’s crowning moment. Anointed by Trump’s approval, within a month he would be crown prince. Rumours of the king’s imminent abdication in his favour – though untrue – were about to begin. There had been previous signs of his rising star, his promise and his flaws, but this was the moment when the whirlwind took off. It was a whirlwind that at first struck Middle Eastern hands as a cleansing storm, fresh, a herald of something new where innovation was badly needed. But it span rapidly out of control, until it blew out with the slashing and cutting of a bone saw in Saudi Arabia’s consulate in Istanbul and the murder of Saudi Arabia’s best-known journalist, Jamal Khashoggi. Read the full article for a good inside look at the Saudi Crown Prince and his surroundings.